Quilters use an Inspira quilt frame to load a quilt top, batting and backing onto a quilting machine. You can adjust these frames to the size of the quilting piece, up to 106 inches in length, and for stand-up or sit-down quilting. The Inspira quilt frame is lightweight and moderately easy to set up when you know how to do it. Place the quilt frame onto the quilting machine carriage. Roll the quilt top, batting and backing onto the roller bars of the quilt frame. 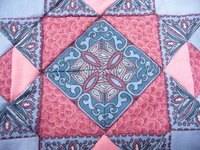 Tighten the quilt on the frame by adjusting the "Soft Touch" knobs, turning them to the right for more tension and to the left for less tension. Attach the Velcro tension clips to the quilt at both ends of the frame. Place your quilt pattern on the Loading Shelf. Turn the "Start" knob to "On," and trace a few inches of your quilt pattern to test the tension of the quilt on the Inspira frame.